...sublteness... aka the LJ has been updated with a ton of on-line quizzes, so if you can't get enough of the quizzes on this Blog, check it out there! NDK is almost upon us! WEEEE! I've been waiting for what seems an eternity for it to get here! I'll be able to meet up with all my Colorado friends! There's also going to be a huge Gaia On-line get together and photo shoot! It'll be fun to see a lot of my Gaia friends in person, though I'm sure I've met quite a few of them before... I'm also on the look out for this particular manga selling table from Florida... You can get manga for as cheap as a $1.50 there! YOSHA! Speaking of tons of quizzes, I just went haywire taking all these quizzes today since I don't have anything to do until after lunch today... So enjoy all of them, and have fun! 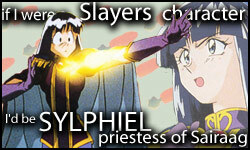 What Slayers Character Am I? I love Sylphiel, but not as much as my Sissy! What Saiyuki Weapon Would I Fight With? Which Saiyuki weapon would you fight with?? What Anime Stereotype Am I? What Get Backers Character Are You? Which GetBackers Character Are You? You are like Fuuchouin Kadsuki! and can easily overcome any situation with a creative flair. your kind outlook on life allow other people to push you around. What Anime Pet Am I? Take the "Which Anime pet are you?" test! What is My Anime Haircolor? Your Inner Eye color is blue! And hear I wanted red! !